Your local firm, a family business with A1 service! The Castle Hill area has been our service area for over 35 years and we are located at Bella Vista. We are a family owned firm and have survived in business by giving all of our customers what they are looking for, a reliable, trustworthy service at a reasonable price. The Home Hub on Victoria Ave caters to people looking for anything ranging from computer equipment to hardware at Bunnings as well as a large variety of furniture stores. 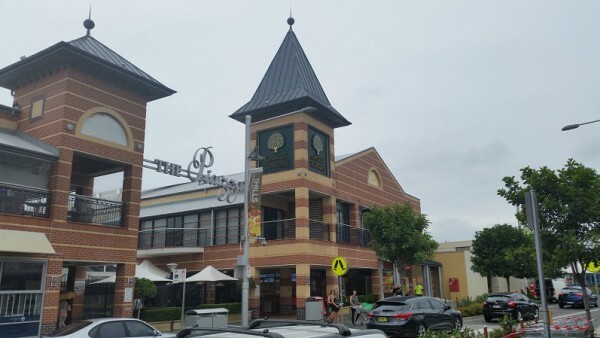 It’s also home to Castle Towers, a shopping mall with a wide variety of shops for the whole family. This is a street view of Victoria Avenue, which is known as a business centre and an industrial area. 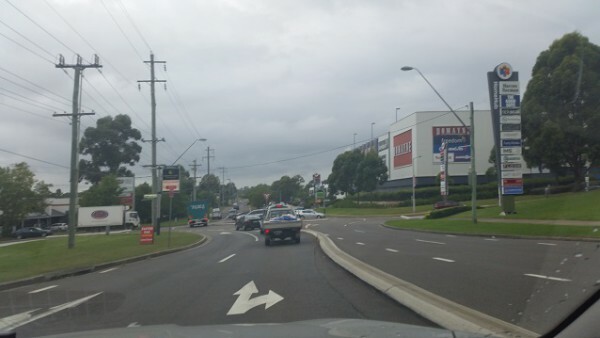 In the background is Domain, Harvey Norman and Home Hub. We are centrally located to all the business and residential regions. This means that we provide prompt, reliable service within our local district. Call us today on 0417 251 911 for bookings or for non-push information on all pests and vermin. 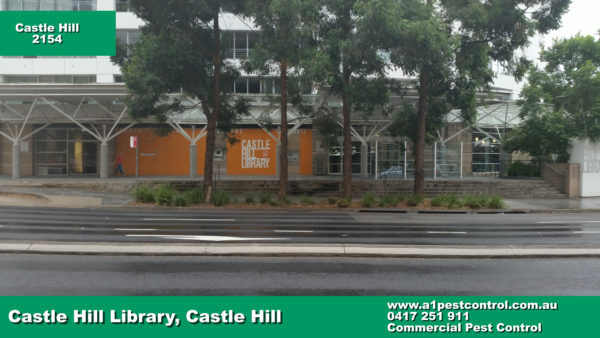 Our local library is frequently visited by the students from nearby schools as well as those travelling from Cherrybrook and Stanhope Gardens, as it offers fantastic learning facilities and resources. The library is also located within walking distance of our major shopping centre which serves as a hub for local shopping and dining service. Cockroaches. Cockroach activity is found in areas where there is food, water and shelter. Business suffer from vermin infestation when they are concerned with food preparation or located close to other buildings where this occurs. Ants. Ant infestations are normally restricted to residential areas, but businesses are also at risk to occasional problems. Spiders. Spider problems are found where shrubbery is found abutting buildings and homes as spiders love hitching their webs to leaves and branches of plants. Also they tend to hang around areas where there are light sources, for example windows. This is so that they may increase their chances of netting prey. Bees & Wasps. Bee and wasp infestations are prevalent during the Spring and Summer time periods. We specialise in these pests when they invade homes at short notice. Bed Bugs. Bed bug issues are becoming more prevalent as air travel becomes cheaper, as people traveling to high risk areas unknowingly transport bed bugs and their eggs. Termites don’t make it to the top 5, but white ant infestations still attack 1 house in 3 at some stage in this location. So it makes good sense to have regular 6 to 12 monthly termite inspections. You can rest assured that all our operators are licence and carry termite accreditation. Thermal termite inspection is available alongside Termatrac radar detection. Picture of Hillside Hotel taken from sidewalk. Hillside Hotel is one of the popular dining venues located at 273 Old Northern Rd and known to burst to life in the evening as it packs out with clients from around the Hills District area. They serve a variety of pub foods as well as pizza and other gourmet selections. 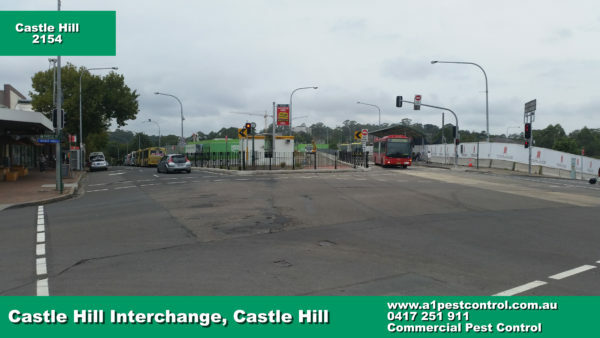 Our Bus Interchange is always busy as it connects the Western Suburbs with the rest of Sydney and supplies transport right into the heart of the city as well as supplying transportation for students to nearby schools. Many people make use of buses to get to Castle Towers to watch movies or enjoy the plethora of shopping options. Our family business is situated in Bella Vista, and we value our local customers. Prompt service and competitive pricing our our hallmarks.